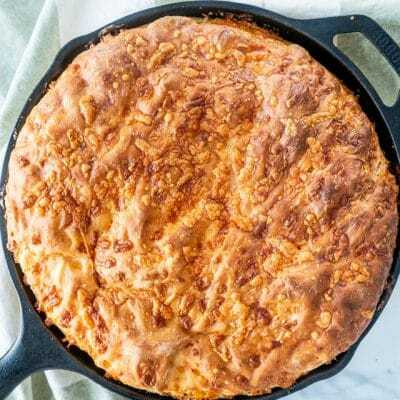 This No Knead Skillet Bread is pillowy soft with a delicious crust, and only 5 ingredients. 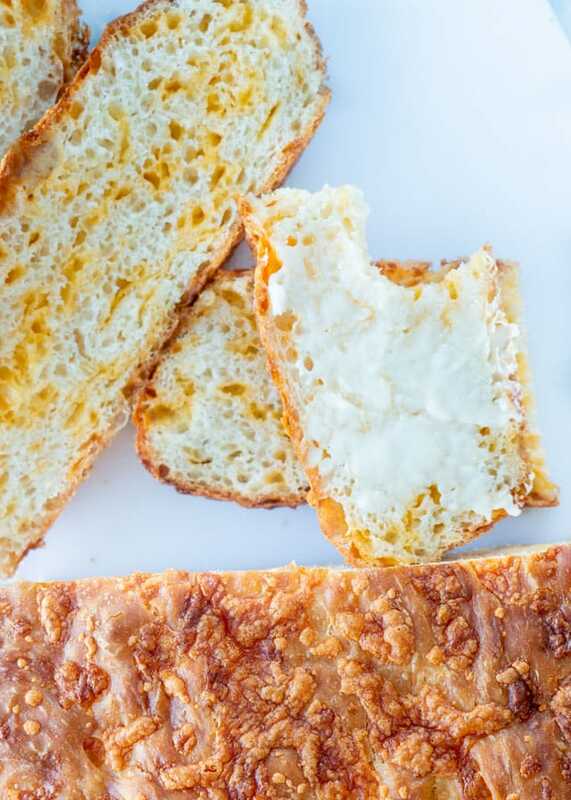 You’ll never want to go back to store-bought bread after you try this simple recipe! You don’t need to be a professional baker to make incredible homemade bread! Especially with a recipe so simple like this one. Better yet, you don’t even need to tire yourself out kneading the dough. Using ingredients that you already have hanging out in your kitchen, I’m here to show you how to make the easiest recipe for bread that’s so soft and delicious. In the past couple weeks, I’ve been experimenting some more with no knead bread, since my no knead bread is one of the most popular recipes on the blog. Many of the questions I get is in regards to different pots and pans you can use. While Dutch Ovens can be quite pricey, you can get a good cast iron skillet for a very decent price. What Is No Knead Bread? The process of kneading bread helps form gluten, which gives bread its strength and elasticity. After a recipe for no-knead Dutch oven bread surfaced in 2006, the secret for easy bread making went viral! Traditionally, no-knead breads are given very long rising times to allow the gluten to form properly. In this recipe, I have found that with two quick rising periods, I got a gorgeous loaf of bread. It is so soft on the inside, with an addictive cheese speckled crust! The entire loaf of bread was gone by the end of the day. When I say this bread is simple to make, I really mean it. First, mix the warm water and yeast together in a bowl and set aside. Next you’ll need to mix the flour, salt, and cheese or any fillings that you choose together. The reason we are separating the wet from dry ingredients is so that your fillings get a nice even coat of flour to prevent them from clumping up and sticking together. This also ensures that the salt is evenly distributed through the bread. Next, dump the dry ingredients into your water and yeast mixture. Using either a spatula or a spoon, combine everything until an evenly mixed ball of dough forms. Now the hard work is all done! Cover your bowl with a dry kitchen towel and leave the dough to rise for about hour. After one hour, your dough should be just about doubled in size. Use a spatula to loosen the edges of your dough from the sides of the bowl, and dump it right into a well oiled cast iron skillet. Make sure the oil covers every surface of the skillet that the bread will be touching. Use the spatula to spread the dough to make sure it’s evenly distributed in the skillet. Cover the dough with a dry kitchen towel once more, and set aside for about 30 minutes for a 2nd rise. While you’re waiting for the dough to rise, preheat your oven to 450F. Once your dough is ready to go, bake it for 45-50 minutes, or until the top of the bread turns golden brown. If you’d like to use a thermometer to be sure your bread is fully cooked, it should read 200F. Let the bread cool in your skillet for about 10 minutes, and then transfer it to a cutting board to cool fully before slicing. You can definitely double this recipe! You will need a bigger skillet, preferably 12″ so that the dough doesn’t rise and bulge over the edges of your skillet. Add another 10-15 minutes onto the baking time. You can make sure the bread is completely done by taking its internal temperature at the thickest part. The thermometer should read 200F. My Dough Is So Sticky! This dough is meant to be pretty sticky! If you check out the video, you can see the consistency of my dough. If you feel that yours is too sticky, you can add a little bit more flour. Every environment is different. If you live somewhere with a lot of humidity, you might need to add a bit more flour to get the perfect dough. The difference is big. When baked in a Dutch oven, you’re baking the bread with the lid on for the first 30 minutes. During this time, steam forms inside the Dutch oven, resulting in the wonderful crust we all know and love. In a skillet, since we bake the bread uncovered, this skillet bread doesn’t really get the chance to develop that super crispy crust. The texture for this skillet bread is also a bit different, because of the rising process as well. The original No Knead Bread takes about 12 to 18 hours to rise giving the bread plenty of time to form gluten. Do You Love This No Knead Bread Recipe? Try These! Fast and Easy No Knead Bread in less than 3 hours, Start to Finish! 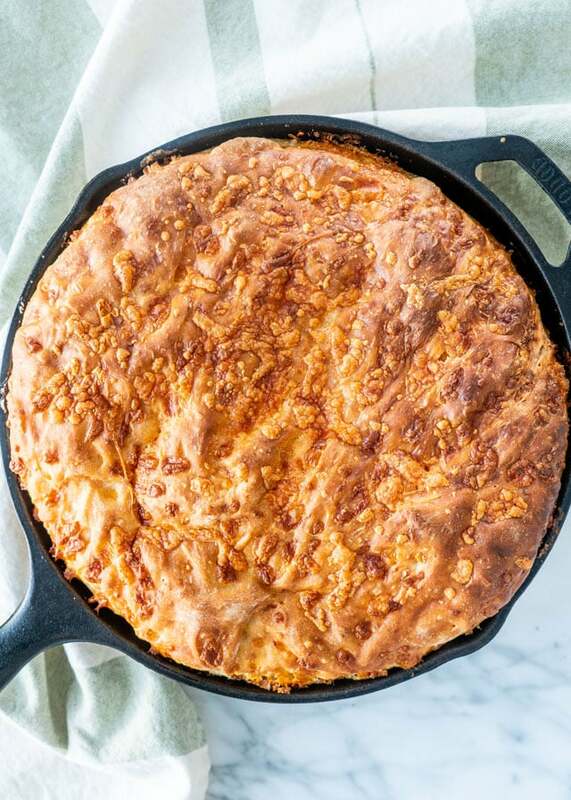 This No Knead Skillet Bread is pillowy soft with a delicious crust, and only 5 ingredients. 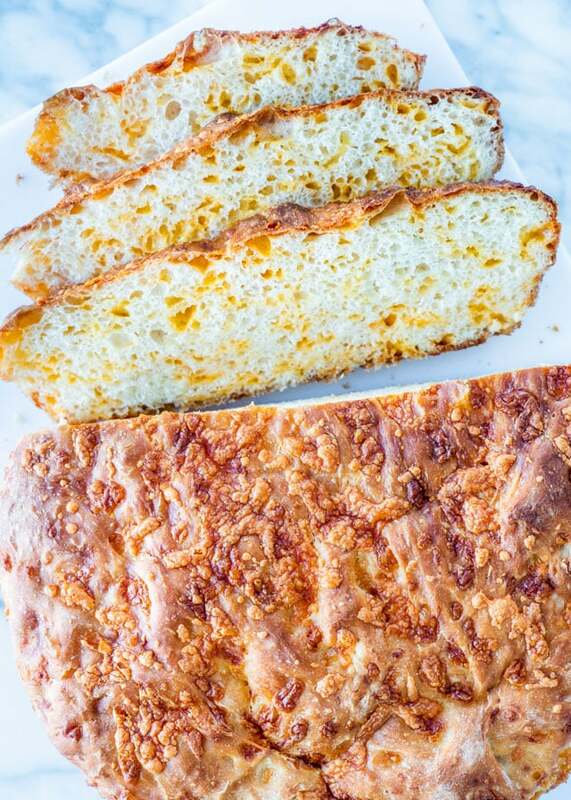 You'll never want to go back to store-bought bread after you try this simple recipe! In a large mixing bowl, mix the warm water with the yeast. Set aside. In a separate bowl, mix together the flour, salt and cheese until well combined. Dump the flour mixture into the large bowl with water and yeast. Using a wooden spoon or spatula, mix the dough until everything is well combined. Cover with a kitchen towel and set aside to rise for about one hour, or until doubled in size. Generously oil your skillet, including the sides. Use a spatula to loosen the dough from the sides of the bowl and transfer the dough to the skillet. Use the spatula to even out the dough so that it fills the skillet. Cover the skillet with a kitchen towel, and set it aside to rise for another 30 minutes. Preheat your oven to 450F (230C). Bake the bread for 30-45 minutes, or until the top is golden brown. Let the bread cool in the skillet for 10 minutes, then carefully remove it from the skillet and allow it to cool fully on a cutting board before slicing. I used a 10" cast iron skillet to make this recipe. If you use a smaller size, the loaf will end up taller. If you use a bigger size, the loaf will end up thinner. 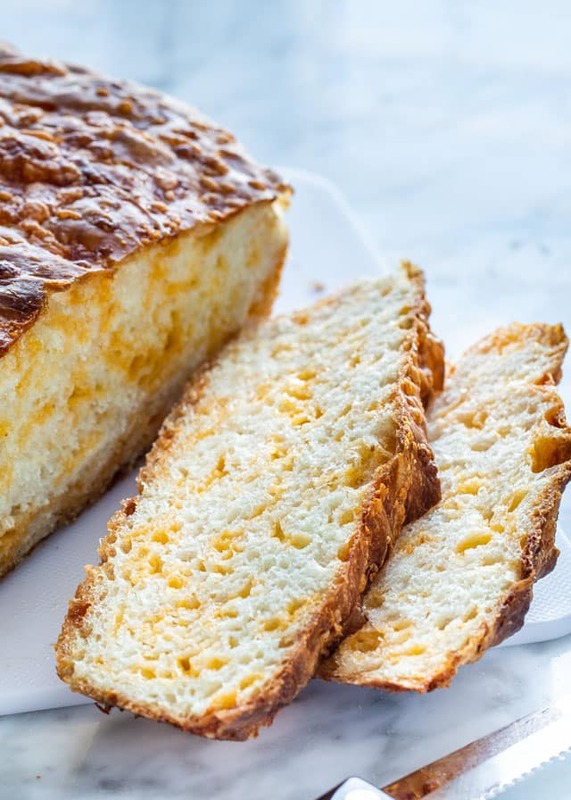 You can make this bread without cheese for a plain loaf. You can also get creative and use ingredients that you would like in your bread. Spices, garlic, onion, hot peppers, dried fruit, etc are all great examples of ingredients you can use in your bread. Why is my bread chewy: Usually your bread will be chewy when there isn't enough gluten formation or you're using a low-protein flour. Why is my bread dense: Usually bread will be too dense when there is too much flour. Keep in mind this dough will be pretty sticky, do not add more flour than specified. Other factors that come into play are humidity and age of flour. Little yeast, long rise, sticky dough are keys to a good, light loaf. I don't have a cast iron skillet, what can I use instead: If you don't have a cast iron skillet, you can use a Dutch Oven lined with parchment paper. A 4 quart Calphalon soup pot would also work. How do I know when my bread is done baking: Tap the bottom! Take the bread out of the skillet, turn it upside down and give the bottom a firm thump with your thumb, or a knock and if it sounds hollow it's done. If using an instant thermometer, the internal temperature should be around 200 F degrees. When you say warm water, can you feel it or do you use the baby bottle test and drip it on your skin. That is an old fashioned saying. If you feel it, it is too hot, if you can’t feel it, then it is just right. I never know how warm to get the water so that it activates the yeast. I have made this 2 X and it is big hit. Had three hungry men go after it and asked for the recipe to take home. Anytime that happens you know it is a repeater! I made this last night and it is DELICOUS! I’ve never made just a regular homemade loaf of bread (although I’ve made beer bread plenty of times ha ha) because it sounds time consuming and my arms aren’t strong enough to make it through all the kneading. This recipe was a snap. I had to proof my yeast (because I only had dry active yeast), but that only took 5 extra minutes. Since I didn’t put in any cheese, I added a little more flour (maybe a 1/3 or 1/2 cup) because my dough was SUPER wet. Instead of cheese, I added about 1.5 tbsp of a dried garlic and herb mixture I had on hand. I started making this around 6:20PM and pulled the bread out of the oven at 8:40PM and was munching on it around 9. YUM! I love the garlic and herb mixture additions you made. So happy you enjoyed the recipe! So easy and so yummy. My kids love to make this with me. Perfect with soup! I came across this page by accident. I am marveling at the ease of it. Would love to try it but don’t have a cast iron skillet or a dutch oven. Any chance there’s a 3rd option? She mentioned at the very bottom that you can use a 4qt soup pot. Yeah, thanks. I saw that but don’t have that either. Also, below in the comments she said that you can use a fry pan if it can handle the temperature. I need a recipe for a small skillet . I’m the only one at my house. If she’s using a 10″ skillet I would think that you could use a 5-6″ skillet and cut the recipe in half. Although your cooking time would be less, so you would have to take that into consideration. Can I use a Cuisinart Chef’s Classic 12” hard anodized fry pan. 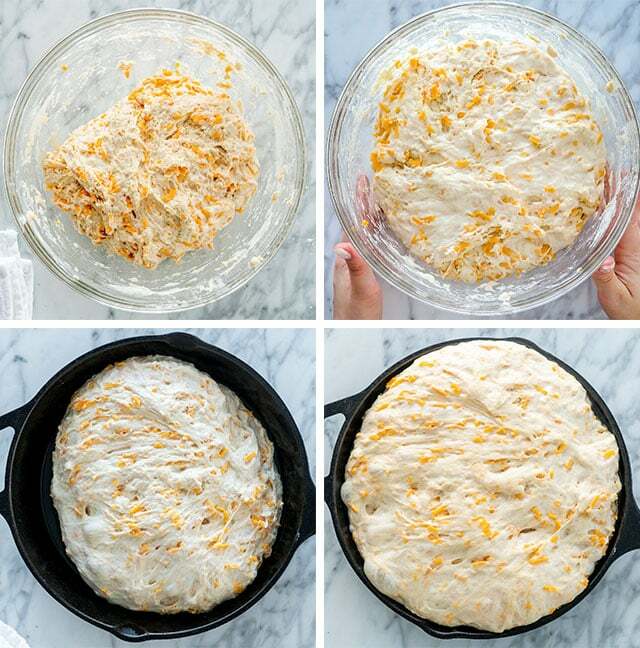 For the cheese bread recipe? Or any of your bread recipes? As long as it can withstand the high temperature, sure! Can I use gluten-free flour for this recipe? You can, but you’ll need a gluten replacement such as xanthan gum so that the bread doesn’t dry out and become crumbly. Easy to put together. I sauteed some jalapenos and added to dough before baking. Taste is very nice and I liked the sponge texture. Thanks so much for this recipe. Made one with cheese (sooo good)! I made another one with craisns and walnuts (with a little brown sugar and cinnamon). That was delicious! We are spoiled! Don’t like Panera anymore! LOL! Ha! I love hearing this!! Hi Jo, great recipe. I’m going to try to make it. Can this bread be frozen after baking? Yes, just like any bread, it freezes well! This is rewarding to make. I make a couple times a week. Not afraid of yeast anymore. My husband and I both LOVE this bread. We go thru it in a day. Thank you for the recipe. My pleasure, glad you enjoyed the recipe, Wanda! My pleasure, glad you liked it! I love that you turned this into an olive bread, must have been delicious! This was so easy to make and the taste is amazing. We couldn’t even wait for it to cool! Great recipe! So easy, so tasty, great texture and flavor. Thanks for sharing this awesome recipe! I’m going to use asiago next time! Als o after it rested in skillet, it rose right to top of skillet. I thought this was going to overflow when baking but it didn’t. Loved it!!! I tried this recipe. It was great. So easy. I skipped the cheese as my daughter is vegan. I put in raisens.. Today I’m going to use whole wheat flour. Let’s see what happens. I also added cinnamon. I’ll let you know. Plain flour is the same as all purpose! Hi! I see the recipe says Instant yeast. Can I use regular yeast? Is there a difference? You can use active dry yeast, but you’ll have to proof it first. Dissolve it in the 2 cups of warm water, and add just 1/2tsp of sugar. Let it foam up for 10 minutes, and then you’re ready to make the dough.